Italian Greyhounds have the smoothest of fine silky coats and are not prone to either flea infestation or tick bites. Regular washing of pet bedding and general household cleanliness will keep fleas at bay. However, it sadly now seems to be the norm for Veterinary Surgeons to routinely prescribe flea and tick prevention treatment. But do you realize that permanent damage can be caused to your sensitive fine skinned IG by these previously ‘believed to be innocuous’ spot on products? The advent of easy to use spot-on products has made flea and tick prevention convenient for many pet owners and certain ticks can carry dangerous diseases making all responsible pet owners extra careful with our preventative routine. Many Veterinarians will tell clients that the majority of these products are harmless and safe, but evidence now shows that both the ‘active’ and some ‘inactive’ ingredients in the spot-on preparations have been linked to serious health effects particularly in Italian Greyhounds. Fipronil – the active ingredient in Frontline remains in the IG’s system with the potential for nervous system and thyroid toxicity. Tests on Laboratory animals resulted in thyroid cancer and altered thyroid hormones, liver and kidney toxicity, reduced fertility and convulsions. Information given out by Frontline creates the impression that the product stays in the oil glands of the skin, but studies have showed that in fact, it does enter the body and the organ system. Imidacloprid – the active ingredient in Advantage has been found to increase cholesterol levels in dogs, cause thyroid lesions, create liver toxicity, and has the potential for damaging the liver, heart, lungs, spleen, adrenal glands and brain. As a neurotoxin, it can cause incoordination along with labored breathing and muscle weakness. When the drug was tested after its introduction in 1994, researchers found an increase in the frequency of birth defects when it was tested on rats, mice and dogs. Pyrethrins – the naturally occurring compounds from the Chrysanthemum plant and pyrethroids the synthetic counterpart are thought to be less hazardous than other tick and flea preventative ingredients. However, over a 5 year period there were at least 1,600 pet deaths related to Spot-on treatments with the afore mentioned ingredients. Which was nearly double the reported fatality linked to flea treatments without pyrethroids. There are alternative measures that can safely be taken to prevent flea infestation. Garlic Oil Capsules which can be purchased from most supermarkets or health food stores. Give one capsule daily in their food. This makes the dog’s skin environment unpleasant for fleas or Harvest Mites. Add a few drops of neat Lavender Oil to a sprayer containing water. Shake and spray carpets and furnishings. Give one tablet daily by crushing between two teaspoons and tipping the powder onto the dogs tongue. Please don’t use any Chemical based flea or tick treatment on an Italian Greyhound. 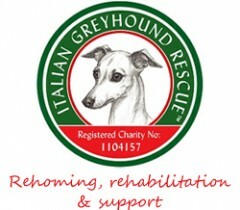 Those breeders who include in their Puppy adverts that their IG’s have been ‘de-flead’ are merely exposing their complete ignorance of the breed; confirming to the world they are breeding for nothing other than financial gain at the expense of the poor Italian Greyhounds welfare.